"If only Titanic had these on..."
market for Suzuki and Geo. XL7 superslider kit thru 2005. Rocky Road has always been well known in Jeeping circles for our lifetime guaranteed Rockrails. We now bring that same design, engineering, and strength to your vehicle! You don't have to be a serious 4wheeler to appreciate the protection these Rockrails provide. Whether you're super hard-core pounding the rocks every weekend, or a scenic traveler towing behind your motorhome, Rockrails are the first modification you should do to any vehicle that see dirt time! As illustrated by the picture, you can see how our 8 point mounting design (9 point on the 4door) offers strength against even the hardest impact on the trail. Can you use them for a HiLift jack? HA! If a rocker guard can't hold up to the gentle caress of a silly jack, how is it going to handle a rock slamming into the vehicle. OF COURSE you can use our Rockrails with a HiLift! 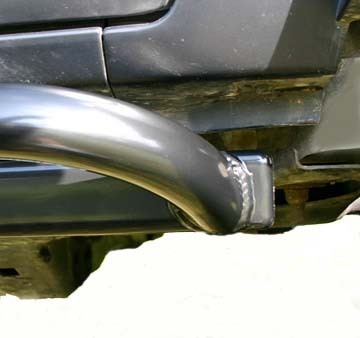 All Rocky Road Rockrails also come with a lifetime warranty against bending or dents. Why can we make this offer even when ARCA competition rigs use our rocker guards? Simply because you cannot hurt them. They are indestructible. Smash it with a sledgehammer if you like, you cannot bend these bars. Try that with those silly round tube nerf bars! Most rocker "protection" on the market is less than 1/8" thickness tube..... worst are the round tube "nerf" style bars that offer no strength whatsoever! Cast that junk a harsh glance and it will likely dent. Drop your vehicle onto a rock with them and watch them fold. Nerf bars are useless and should be crushed like the beer can material they are. Rocky Road Rockrails are built from 3/16" thick hitch tubing. This makes them stronger than anything else on the vehicle.... or on the market. that protect your vehicle from the ravages of even the harshest trails. Body seam mounts align with factory holes so no drilling of the body is necessary. 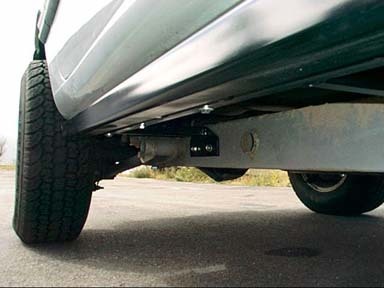 Our Rockrails work with no body lift up to 3" of body lift with a snug lift at any lift height. 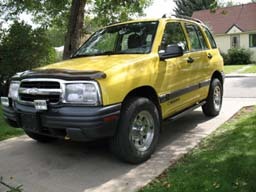 The vehicle on the right is pictured with the 2" body lift and the Rockrails look clean enough to be factory equipment. 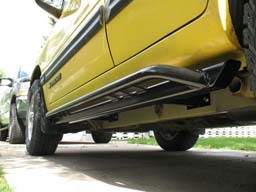 They will work with or without the factory plastic running board trim. 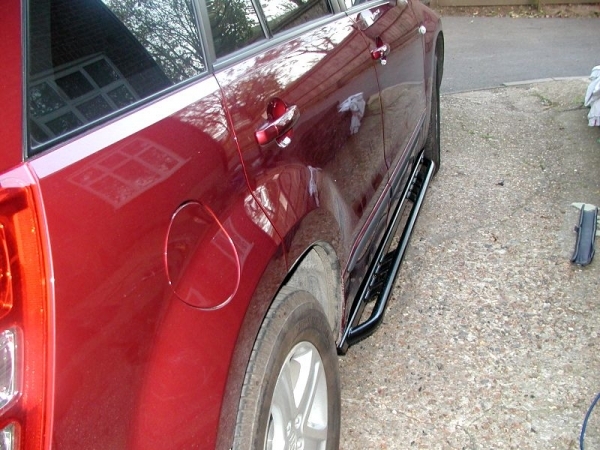 Sidekick / Tracker / Vitara Rock Sliders, Best engineered! 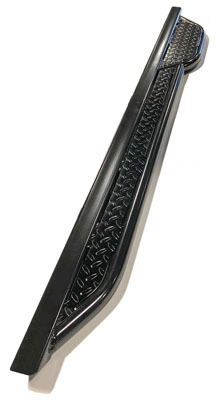 If you're ready to take your rocker protection serious, step up to Rocky Road Rockrails. 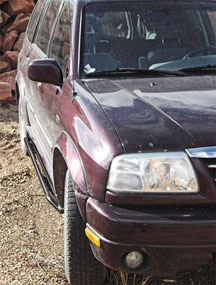 Rockrails are currently available for 99+ 2-door and 4-door Vitaras and Geo Trackers. Other applications coming soon! Picture grid to the right shows shots of 4-door Rockrails. Click on the pictures for a larger view. 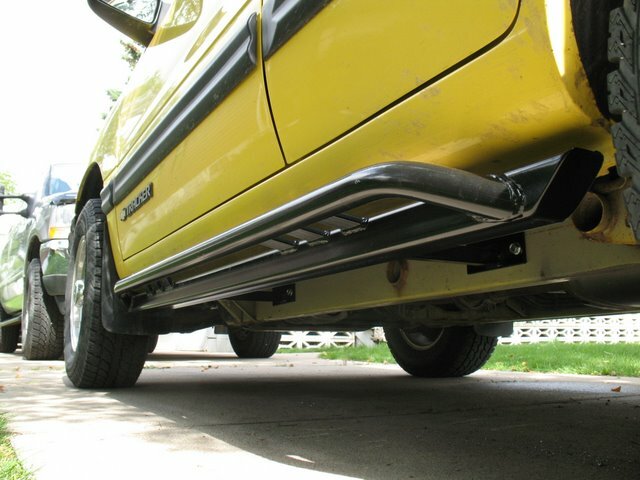 All Rocky Road rockrails can be custom ordered to accommodate 1", 2", or 3" body lifts as well as stock configuration. Please specify this at your time of order. All Rocky Road built parts also come with a very durable and attractive Powdercoated finish. 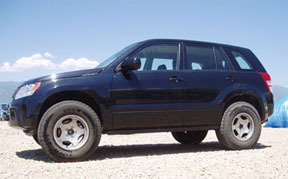 Tracker, Sidekick, Vitara Superslider rock slider kits. These rocker bars offer all the strength and warranty of our regular Rockrails, but with the added bonus of an additional upper tube. This upper tube can provide even more protection against sliding into rocks, trees, or other trail hazards. Shot of Suzuki/Geo Supersliders. Nothing is as beautifulor protective for your vehicle.... nothing! Lower shot on 2006 Grand Vitara, courtesy of Metatrox.net. Everyone who has seen these on our shop 4x4s has wanted a pair. They are unequaled in strength and looks. They also make an excellent step for access to roof racks and such. Each Super Slider kit mounts identical to the standard Rockrail for the vehicle. It also still features that great looking 45* front and rear edge. Not only good for looks, but alot more practical for trail use than our competition's squared off ends. This is basically the same proven design as our world famous Rockrails, only with the extra slider tube up top. The extra slider tube up top offers additional side protection on the trail and off the trail. One of our favorite uses of the Superslider is as a bash guard against other swinging doors in a parking. Imagine the dismay of the chump who just threw open his car door only to whack it on the solid steel of your Superslider. He just stuck a nice dent in the edge of his door, your Toy still looks cherry! Jeffrey Riplinger sent us this pic of his cool ride with Rocky Road Fender flares, AND our Kicker sliders! Painted to match his RV which he also sent us a sweet shot of. Click the pic to view a larger shot! Sidekick, Vitara, Tracker, all of them! Same great mounting strength and overall design as our Superslider kits, but with that extra rear kick-out section in back. For years these have been hugely popular with the Toyota guys, and now Rocky Road is finally bringing them to Suzuki & Geo people! 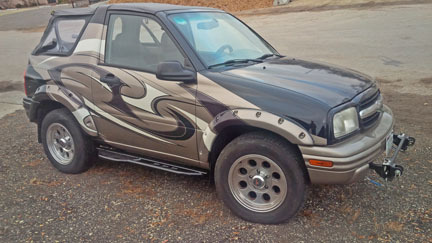 These kits offer superior protection, amazing good looks, and as you can see in the photo at left, the rear Kicker portion also features a Diamond Plate cover for a really cool look and the kit also provides excellent access for roof racks, as well as for use as a step into your vehicle. 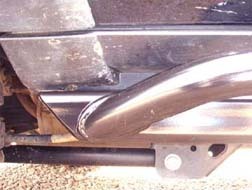 Pictured at left is an example of an engineering detail of the Rocky Road Rockrail kits over others on the market. This just helps demonstrates one of the many superior engineering points in our system. Notice the top picture at left is a Rocky Road rock slider kit. See the beveled edge? The nice 45* ramp which would slide up and over any rock or stump on the trail? Its takes more time and effort to manufacture the kits this way, but that's all included with the Rocky Road kits. Now take a look at the lower picture at left. This is from a competitor. Similar pricing for the rocker kits, but they cut their production costs by making the end a blunt square. Run that thing into a rock and you can clearly see the trouble you will face. Its a battering ram, not a rock slider. It could stop your vehicle cold or require you to bash away until something gives. Why would they build their kits with this engineering defect? Simple... its cheaper to manufacture with the flat end, so that's what they go with. Also notice how much further down their kit hangs. Rocky Road kits tuck up tight! This is one easily observed engineering advantage the Rocky Road kit offers... but there are many more. 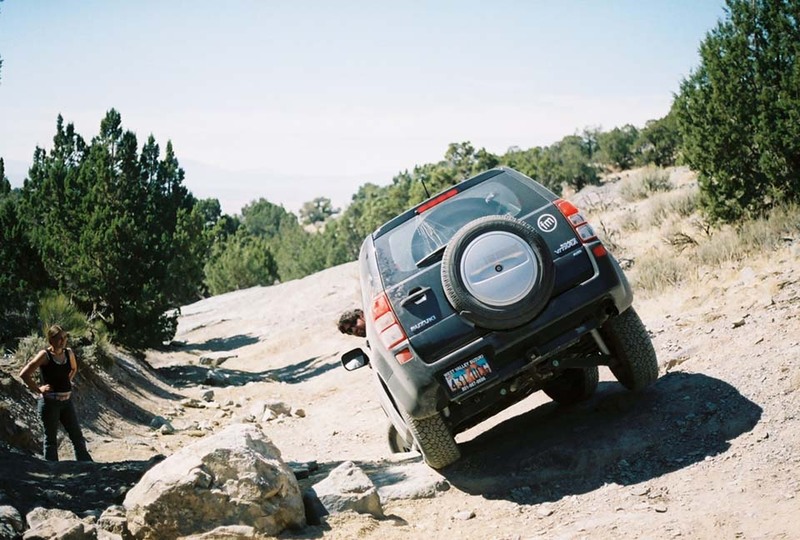 Jerry Bowling testing out our Rockrails on 'Rattlesnake' in his 2006 Grand Vitara.